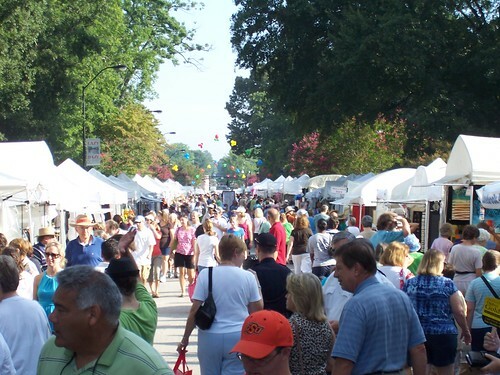 Downtown Cary will be bustling this Saturday from 9am-5pm with over 300 artists from all over the country. This annual event located along Academy Street draws a huge crowd every year. In addition to arts and crafts there are activities for the kids, a beer garden for adults, and music for everyone to enjoy. As with any popular event, parking is something to think about. A convenient way to get to and from the festival is by picking up one of the shuttle buses that depart from the Cary Towne Center Mall. My advice is to try and go first thing in the morning before the festival gets too crowded and bring something cold to drink! You can download a PDF of the festival map here. For information on parking and the festival shuttle buses you can pick up at Cary Towne Center check out the event website. It was SO warm, but not as HOT as last year. A good time to get out in the crowd of folks, all who seemed to be having a good time. Enjoyed the bands on the stage at Fidelity Bank. Thanks for the report Mike. The weather did seem cooler this year. I’m sorry I missed it. I think it is great that they have live music. All in all I think this is a well organized event considering the large size. The fact that they organize shuttle buses from the mall is a huge plus. Hope to make it next year!